Buckaroo, a photo by thehutch on Flickr. 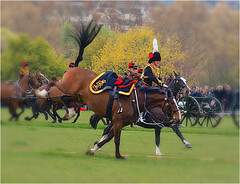 When watching the parade and gun salute for the Queen, in Hyde Park, yesterday, there was an unexpected spectacle as one of the horses was ‘spooked’ by the events. This was not a part of the programmed events but there was a valuable lesson. The crowd were taken by the horse acting out of character, it was bucking and acting in a way that was out of control. However, whilst this was happening, all the participants of the parade ignored the horse and continued with their responsibilities. Everything else appeared as clockwork. Horses are herding animals and so as the parade closed, the bucking horse followed the herd. In leadership, we often spend hours concentrating on the ‘bucking horse’ at the expense of everything else. There are times that we could ignore the commotion and see no apparent negative affects to our needed outcomes. Do we spend too much time and focus too much attention on the ‘bucking horse’? Who are you watching? Who is stealing your time?